Discovery Gardens is a hands on agriculture program, similar to a community garden, only better. You will learn to plant, tend, and harvest in your own garden space right here on the farm. We provide the guidance at our weekly garden classes and everything you need for your garden is included. We handle all the irrigation, pest management and fertilizing for nutrient density. You will learn to grow your garden the way nature intended: without the use GMOs, herbicides, chemical fertilizers and pesticides. The soil is prepared for you and ready to plant. Seeds, plants and amendments are provided. Classes offered two days per week. Come to the classes and take home the harvest. Once you reserve your garden, you will begin to plant from our selection of transplants and seeds. Weekly classes teach you how to plant, manage, and harvest your own naturally grown food. A new experience awaits gardeners each week. Classes are held Wednesdays and repeated Saturdays for your convenience. 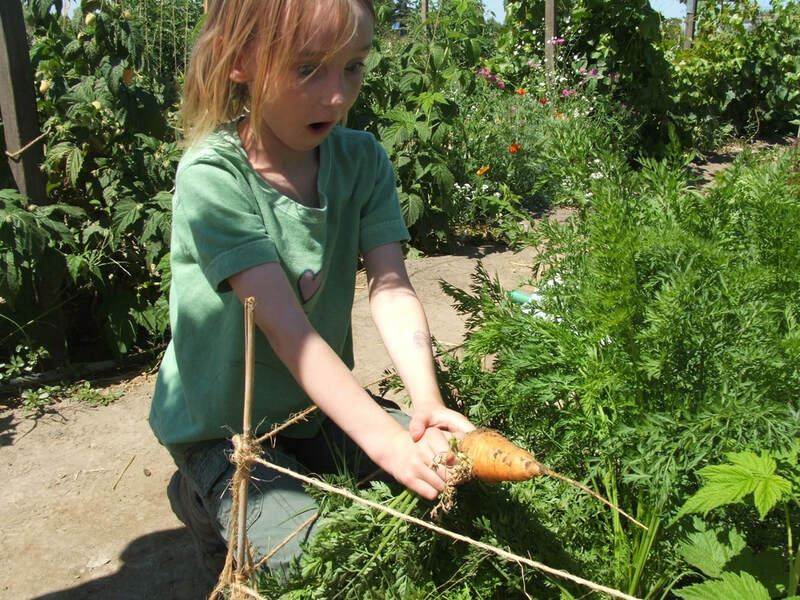 This program is designed for families and for the gardening-curious. The cost of the season covers the food you grow and seed you will utilize while you are at the farm. *Genesis Organic Farm cannot guarantee the harvest. Only God can do that. Discovery Gardens will begin Wednesday, March 28, 2018. The cost of the season is $425.00. $25.00 of your seasons expenses will be treated as a deposit and returned at the end of the season given you clear your garden space before leaving. The season will run for 26 weeks, ending Saturday, September 22, 2018 with our annual Harvest Party. All members and family are invited to the party. This is where we compare how much each of us has grown during the season and share home made dishes crafted from our harvests. Discovery Gardens 2018 begins March 28 and ends September 22. The season is 26 weeks long. Classes are held Wednesday mornings at 10:00 am - 11:30 am and then repeated Saturday mornings at the same time. What can I expect when I get to the farm? The first ten weeks or so of Discovery Gardens consists of planting and seeding your garden. During this time you will be instructed one on one by Tracy. It is highly recommended that gardeners attend each weekly class to stay on schedule to realize their garden's highest potential. The second half of the program is a little more relaxed. The remainder of the season focuses on harvesting and maintenance of your garden. Once the gardens reach peak harvest (right around June-July) you will want to come out at least once a week to harvest. This will insure your produce does not over-ripen or spoil. The cost of the entire season is $425. This covers the plants and seed you use, and the produce you grow. $25 of your fee will be returned to you at the end of the season as a deposit if you clear your garden in preparation for winter. Can I garden with a partner? We welcome and sometimes recommend gardening with a friend. Your garden can produce quite a bit of food in a season. Its a great idea to split the cost, labor, and harvest with a partner. However, one bill will be issued per garden. The terms of your garden partnership are up to you. We're currently full. . . Discovery Gardens will begin assigning gardens January 2018. If you are interested in signing up, please fill out the form. Garden spaces are limited and will be assigned on a first come, first serve basis.